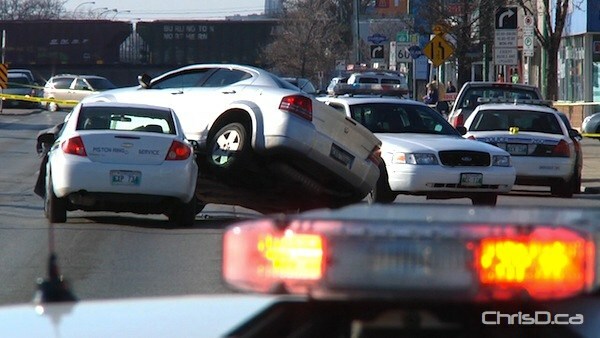 Winnipeg police shot a 14-year-old male believed to be driving a stolen vehicle late Monday morning. Officers taped off a large area on Portage Avenue and Valour Road shortly after 11 a.m., blocking east and westbound traffic. Officers on scene say police were pursuing a stolen vehicle at the time, and motioned for the driver to stop. 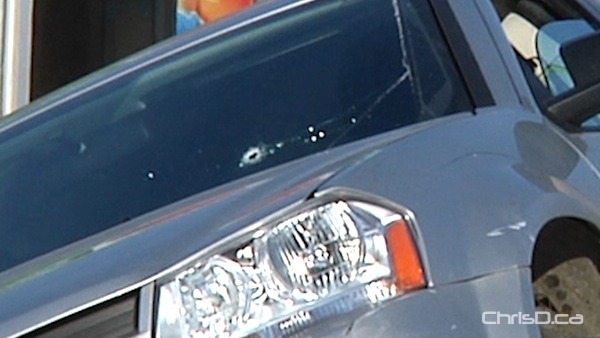 When the suspect didn’t, an officer fired at the car, sending a bullet through the windshield. The driver was taken to the Health Sciences Centre in critical condition, but was later upgraded to stable condition. He has since been released. Two other male youths were taken into police custody, where they remain at this time. During a media briefing at the scene, police said officers first spotted the stolen grey Dodge near Maryland Street and followed it to Valour. UPDATE: Tuesday, November 9 — Police have charged a 14-year-old boy in connection with this incident. He remains at the Manitoba Youth Centre. A 15-year-old and 17-year-old boy are also facing charges, and were released on a promise to appear.